Beware of little ghosts and goblins knocking at your door. Trick-or-Treating in the Village will be on Wednesday, October 31, 2018. 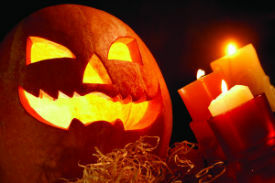 While there are no mandated hours, the Police Department recommends trick-or-treating during daylight hours. Anyone under 17 years of age is prohibited from being on the street after 11:00 p.m. Sunday through Thursday, and midnight on Friday and Saturday. Kids should trick-or-treat with parents or in groups - never alone. Wear light colored or reflective clothing. Decorate your costume and treat bag with reflective tape. Choose face paint and makeup rather than masks that block your vision. If you do choose a mask, it should not obstruct vision. Stay on the sidewalk and watch for cars backing out of driveways. Cross streets at corners using the crosswalks and traffic signals. Do not be distracted by talking on the cell phone while walking near roadways. Only accept treats that are wrapped and securely sealed. Parents should check treats before they are eaten. Vandalism is a crime. Please remember that Halloween is not an excuse to damage or destroy someone else's property. Slow down - kids are excited on Halloween and they may not be paying attention when near the roadway. Use caution entering and exiting driveways. Eliminate any distractions inside your car so you can be alert to your surroundings.